– Genzebe Dibaba, the younger sister of Tirunesh Dibaba, after crushing the indoor 1,500m world record with 3:55.17 in Karlsruhe, Germany. The previous world record was 3:58.28 set by Yelena Sobolova of Russia; Dibaba’s time is arguably the greatest 1,500m ever run as it is the fastest time indoors or out since 1997. King Ches Closes in 3:55.6 for Oregon's A team 9:28!!!! Who lives a better quality of life: A 16th century English king or an American making 35,000 a year? 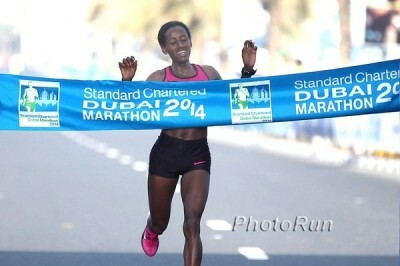 WRGenzebe Dibaba's 3:55.17 1,500m Crushes World Record!!!!! Genzebe Dibaba, the younger sister of Tirunesh Dibaba, ran 3:55.17 for 1,500m in Karlsruhe, Germany to absolutely destroy the previous world record of 3:58.28 by Yelena Sobolova of Russia. Dibaba's time is arguably the greatest 1,500m ever run as it is the fastest time indoors or out since 1997. Nixon Chepseba ran 3:37.02 to win the men's 1,500m. Caleb Ndiku won the men's 3,000m in 7:36 with Augustine Choge, Yenew Alamirew and Bernard Lagat 2-4. Jenny Simpson Talks To RW About Competing In The Historic Cinque Mulini XC Race In Italy Last Week, Where She Finished 3rd Simpson talks about the unusual course which takes you through buildings and up stairs. 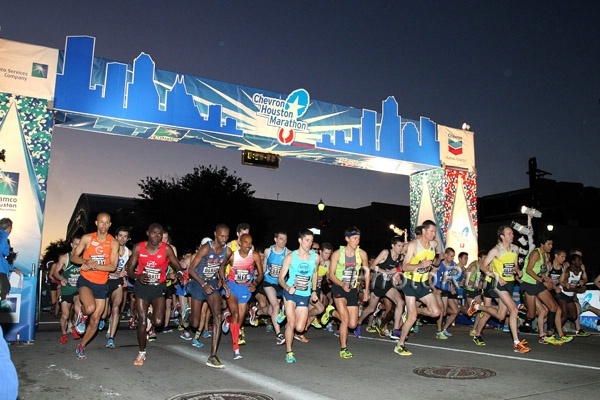 Ken Goe Questions Why USATF Waited To Announce Olympic Marathon Trials Site The Same Week As The Super Bowl We doubt it would have got much mainstream media attention anyway, but maybe it would have been gotten more hype with LA local media. The Guardian Asks “Will anyone ever run a sub-two-hour marathon?” Some interesting quotes from David Epstein (bestselling author of The Sports Gene), who says “right now it seems really unlikely.” Also an overly-optimistic quote from Stephen Kiprotich, who thinks someone will definitely run 2:02 before Rio 2016. Doesn’t he remember London last year, when the best in the World went out at 2:03:08 pace and died? 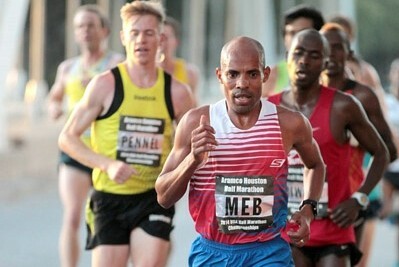 Results: PSD Bank Meeting Dusseldorf Highlights included Kenya’s Bethwel Birgen going from rabbitting Rupp last week to winning the 1,500 (3:39.05) over Nixon Chepseba and Silas Kiplagat (3rd and 4th). Erik Sowinski was 4th in the 800 (1:46.84) where Poland’s Adam Kszcot won in 1:45.42 over GB’s Andrew Osagie. Caleb Ndiku won the 3K in 7:38 over Albert Rop; Augustine Choge was 5th and Edwin Soi 7th. Hellen Obiri won the women’s 1,500 in 4:07.01. 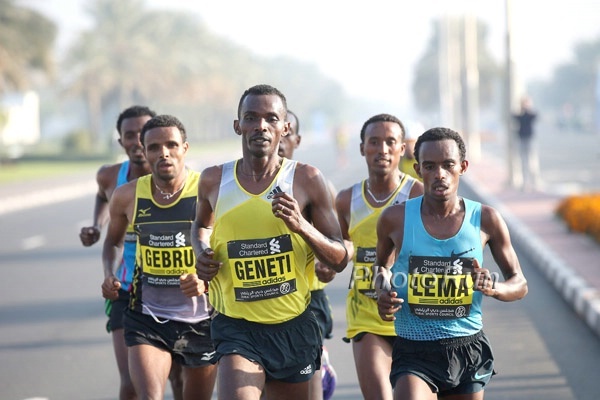 Weekend Preview: 2:08 Man Kazuhiro Maeda Going For Yuki Kawauchi’s 2:08:15 CR At Beppu-Oita Marathon At the Kagawa Marugame Half Marathon Martin Mathathi faces Aussi Collis Birmingham and Ethiopia’s 2:04:48 marathoner Yemane Tsegaye. 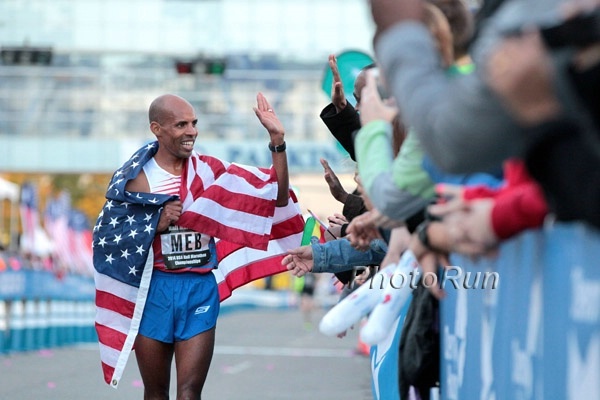 The 2016 Olympic Trials Marathon will be in Los Angeles. 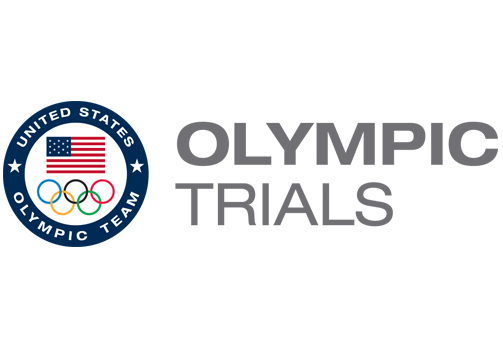 Reportedly, a USATF panel voted 5-0 to put the Trials in Houston, but that recommendation was ignored by USATF CEO Max Siegel. One big change, likely because of the panel favoring Houston, was the date of the LA Marathon (and the Trials) being moved to the middle of February, so athletes could double back to the Track Trials. 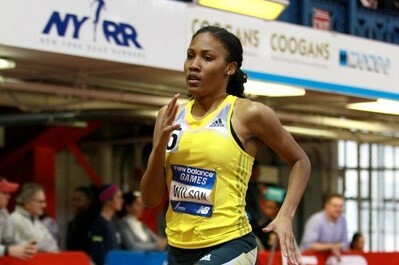 Kim Conley 4:24.54 Armory Record! 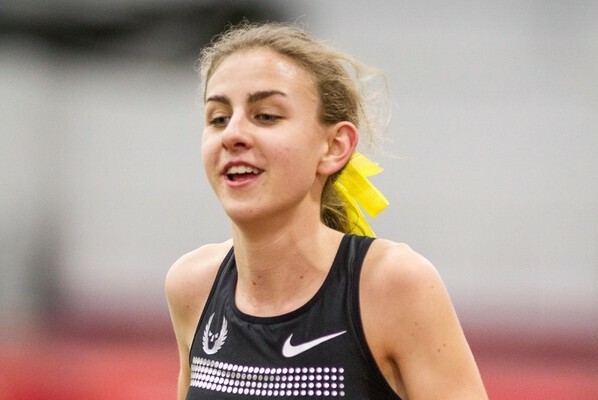 LRC Alexa Efraimson Breaks Mary Cain’s High School And US Junior 3,000m Record With 9:00.16 High school junior and 16-year-old Alexa Efraimson came in 4th place in the 3,000m at the UW Invy, breaking Mary Cain‘s 9:02.10 record. We share a few quick thoughts on Efraimson’s extremely impressive run and tell you where it stacks up compared to Cain. University Of Washington Invy: Lawi Lalang Destroys 3k Field With 7:44 Lalang won easily with Stanford freshman Sean McGorty 2nd (7:59) and Chris Solinsky a DNF. Luc Bruchet ran 3:57.71 to take down Evan Jager and Dan Huling as Alan Webb was way back in 4:03. Amanda Winslow ran 8:56 to win the 3K and Lauren Fleshman continues comeback from pregnancy with 4:42 in the mile for 2nd. 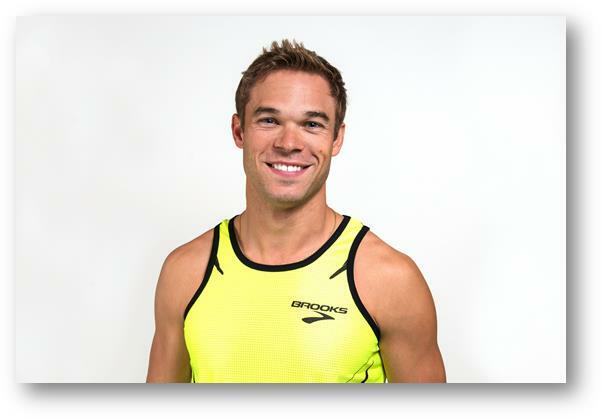 Camel City Hilton Garden Invitational: Nick Symmonds Opens Season With 1:48.64 Victory Symmonds beat a field that included Brooks Beast TC teammates Mark Wiezorek (3rd) and Cas Loxsom (4th) as Heather Kampf ran 2:04.28 to beat Phoebe Wright by .01 and Maggie Vessey was 5th. Sara Vaughn won the mile in 4:35.07. OSU Dominates Razorback Invy 3k, Going 1-2-3 As First Four Places Go Sub-8 Kirubel Erassa won in 7:54.05. *Texas A&M Gets Two World-Leading Marks Deon Lendore set the 400 WL with 45.47 as the Aggie women’s 4 x 400 ran a WLing 3:31.07. *Full Results From Razorback Invy Arkansas’ Grace Heymsfield took the mile in 4:34.22 over teammate Dominique Scott (4:36.11). Ryan Schnulle won the 800 in 1:48.05 as top 6 all went under 1:50. OSU freshman Savannah Camacho won the women’s race in 2:05.41. Indiana Relays Full Results: Molly Beckwith Runs 4:34 Mile Saucony sponsored Molly Beckwith dominated the mile by 12 seconds with 4:34.44 as Team Indiana Elite’s De’sean Turner won the men’s race in 3:58.50. Full Results From Penn State National Stanford’s Justine Fedronic won the 800 in 2:03.25 over teammate Amy Weissenbach as Georgetown’s Billy Ledder won the men’s race in 1:48.92. Penn State’s Brannon Kidder took the mile in 3:59.55 as Duke’s Audrey Hutch won in 4:42.93. Villanova’s Patrick Tiernan set a 3,000m facility record with 7:57.75 as Emily Lipari won the women’s race in 9:09.37. MB: Morgan Uceny 2:04, Jen Rhines 9:16 at Harvard Katie Matthews won the 3k in 9:11. 2014 New Mexico Team Invy Full Results Arizona State’s Shelby Houlihan won the mile in 4:43.70 as Notre Dame’s Jeremy Rae won the men’s race in 4:02.62. Penn State National: Penn State Runs Second-Fastest Indoor DMR In NCAA History To Win At Penn State National The team of Brannon Kidder, Robby Creese, Brandon Bennett-Green and Za’Von Watkins ran 9:26.59 as Stanford was second in 9:28.95, anchored by Michael Atchoo in 3:57. Stanford Women Break School Record & Post NCAA-Leading DMR Time To Win At Penn State In 10:54.04 The team was anchored by Justine Fedronic in 4:33. A distant second was Dartmouth In 11:02.21, led by Abbey D’Agostino‘s 4:32 anchor leg. UW Invy: Oregon DMRs Go 1-2 At UW Invy Posting The Second And Fourth Fastest Times In The Country This Year The Oregon “A” team led by Mac Fleet and Edward Cheserek ran 9:28.91 to win over the “B” team, which ran 9:31.64 and was anchored by Trevor Dunbar. Live Streaming Link For New Mexico Team Invitational In Albuquerque Teams competing include Arizona State, LSU, Notre Dame and more. MB: King Ches Closes in 3:55.6 for Oregon’s A team 9:28!!!! 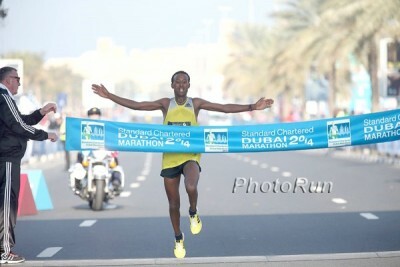 Martin Mathathi Wins Kagawa Marugame International Half Marathon In 1:00:11 As 20-Year- Old Kenta Murayama Gets Second In 1:00:50 For Japan Collegiate Record Aussie Collis Birmingham was 15th in 1:02:40 as the top 26 all broke 1:03. In 27th at 1:03:00 was US’s Jeffrey Eggleston. 59th place was Tomoki Kawamura, who ran 1:04:08 to set a Japanese HS record. Eri Makikawa won the women’s race in 1:10:27 in her debut. Uganda’s Abraham Kiplimo Sets 4-Minute PR To Win Beppu-Oita Mainichi Marathon In 2:09:23 He beat a couple of Japan’s top marathoners to do it, including 2:08:00 man Kazuhiro Maeda. Back in the “masses,” Yuki Kawauchi‘s youngest brother Koki Kawauchi ran 2:21.48 for 32nd. Further back, 59+ world record holder Yoshihisa Hosaka became the 5th fastest 65-year-old ever by running 2:49:01. Crazier than that, his 2:49 got him 427th place! Non-Championship Year = Track Baby Boom: Russian Media Reporting That Russia’s Pole Vault WR Holder Yelena Isinbayeva Is Pregnant The father is national-level javelin thrower Nikita Petinov (PR of 74.88m). Recommended Read: A Look Back At The 1974 Commonwealth Games 1,500, Considered By Many One Of The Greatest Middle-Distance Races Of All Times The athletes themselves tell the story of the race where Tanzania’s Filbert Bayi broke Jim Ryun‘s WR in a race that included distance legends John Walker, Rod Dixon and Brendan Foster. Hundreds Of Charity Runners Will Run Boston In Tribute To Bombing Victims The charitable foundation started by the parents of 8-year-old victim Martin Richard had more than 250 people in 35 states and several countries submit 11-page applications. Sibling Rivalry Motivated 18-Year-Old Irish Sprinter Kieth Doherty To Break Irish Junior 60m Record Doherty was in the same race as his 16-year-old brother (reigning Irish U-17 100m champ) and said, “I was terrified my little brother was going to beat me. He’s a great talent, we often race in training and he sometimes beats me, so there’d be a fair bit of rivalry between us.” Doherty ran 6.88 to his brother’s 6.97. European Athletics Profile On Belgium’s Mid-D Runner Pieter-Jan Hannes, Who Won The Under-23 European XC Champs Hannes enjoyed a very successful 2013 as he set a 3:35 1,500 PR and won the European U-23 Outdoor championships. GB Sprinter James Dasaolu Wants 3 Medals In 2014 At European Champs, World Indoors And Commonwealth Games Dasaolu had a breakthrough year in 2013 when he became the second fastest GB sprinter in history with 9.91 and is currently the 60m World leader. 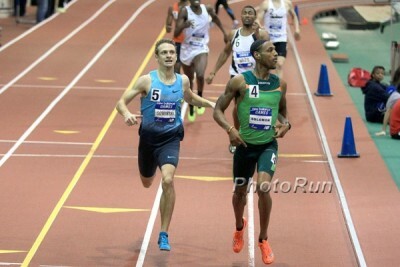 Duane Solomon, the second fastest American ever at 800, has decided to extend his indoor season and put together a 4x800 team to try and beat the American record in a clash vs the Nick Symmonds led Brooks Beasts team and the Robby Andrews led NJ-NY track club. The meet will be live on the NBC Sports Network next Saturday. Update: Duane's team has been announced and includes Erik Sowinski. Mary Cain will race Morgan Uceny on the women’s side and Centrowitz will take on Nick Willis, Lawi Lalang and Alan Webb in his final indoor track race. Meet will be live on NBC Sports Network. Oscar Pistorius Murder Trial To Have Its Own 24-Hour TV Channel In South Africa The channel will launch on March 2, the day before Pistorius goes on trial for killing his girlfriend Reeva Steenkamp last February. 19-Year-Old Russian Mid-Distance Star Alexandra Gulyaeva Suspended For Failed Drug Test She won the 1,500 at the Russian National Junior Championships in 2012. Three Biathletes Test Positive Before Sochi 2014 Two were Russian, including their reigning European champion. 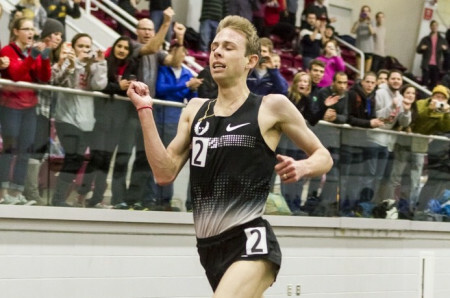 Two For Two LRC Galen Rupp Gets Back The American Two-Mile Record, Runs 8:07.41 In Boston Bernard Lagat‘s 8:09.49 and Rupp’s previous 8:09.72 AR are history as he went for it big time tonight. Rupp took a crack at Kenenisa Bekele‘s 8:04 WR as he was at 4:59 at 2k but faded a bit at the end. 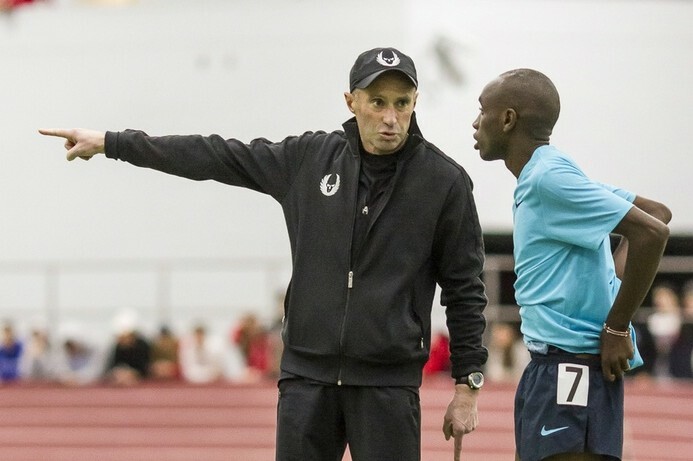 *LRC Interviews With Galen Rupp And Alberto Salazar After Rupp’s Record Run Both seem very excited for his mile AR attempt in 3 weeks. MB: Lee Emanuel and Garrett Heath Both Run 3:54 at Armory Heath showed the form he used to beat Bekele and Kiprop but Emanuel got the win. MB: Kim Conley 4:24.54 for the full mile at the NB Games A big PR for the Olympic 5,000 runner. Mary Cain ran her best race of 2014 but in the end she missed the world junior mark by .01. 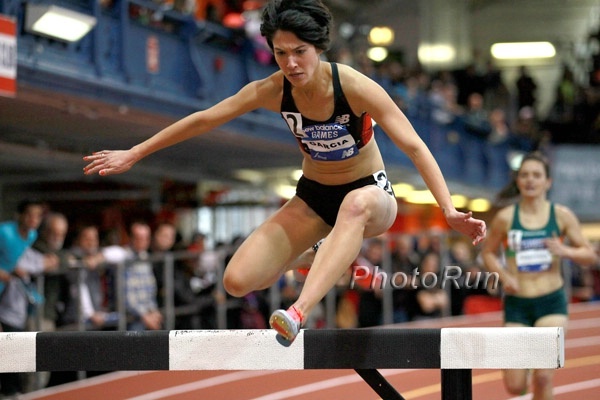 Abbey D'Agostino and Jordan Hasay ran lifetime bests in second and third. France’s Olympic Pole Vault Champ Renaud Lavillenie Getting Closer To Sergey Bubka’s WR As He Clears 6.08m In Poland His 6.08 is second on the all-time list behind Bubka’s 6.15m. Renaud took a shot at the WR here and got close with his 2nd attempt. Jamaican High Schooler Javon Francis Runs 45.95 To Win 400 At Youngster Goldsmith Classic Francis helped Jamaica win a silver medal in the 4 x 400 at Moscow World Champs. AW Recap: British Universities And Colleges Cross-Country Championships Georgia Taylor-Brown beat Emelia Gorecka in the women’s race as Richard Goodman won for the men. Sunday: IAAF Preview Competitive Fields At Russian Winter Meeting: Ethiopia’s Mohammed Aman Going For 600 WR In Race With Erik Sowinski The record is 1:15.12 from 1999 by Germany’s Nico Motchebon. 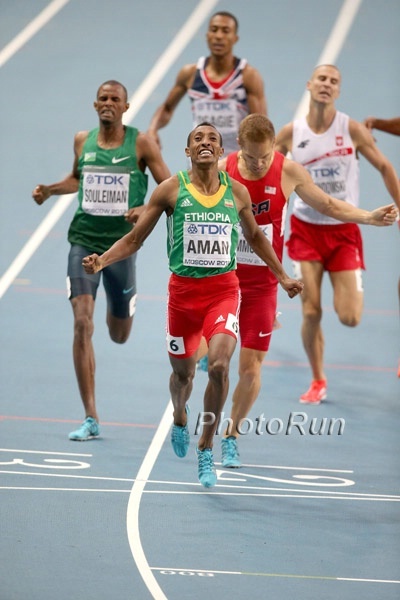 Aman ran 1:15.60 here last year and this year will face Sowinski and Poland’s Adam Kszczot, who has run 1:15.26. In the women’s 800, Pamela Jelimo takes on a deep field that includes Russia’s Olympic bronze medalist Yekaterina Poistogova. And another WR attempt will go down in the HJ with Russia’s Olympic champ Ivan Ukhov. Ethiopia’s Hiwot Ayalew Will Look To Extend Her Winning Streak At Sunday’s Algarve Almond Blossom XC Race In Portugal The race also serves as the European Club XC Championships and will see Spain’s 2013 Euro XC champ Alemayehu Bezabeh take on Italy’s 2012 champ Andrea Lalli. Mo Farah Putting In 130-140 Weeks In Kenya Getting Ready For His “Toughest Test” At The 2014 London Marathon “It’s hard, but I have to do it. It’s London. I could easily sit back and say I’m going to stay at home and train but I need to come out here to give it 110%.” Farah doesn’t share a specific time goal but says he’d be disappointed if he didn’t break Steve Jones‘ 2:07:13 UK record. London Race Director Hugh Brasher And Elite Athlete Coordinator David Bedford Talk About London Field And Mo Farah Brasher pointed out that Jones’ record from Chicago 1985 is the longest-standing UK record and if Farah gets it, he’ll have everything from 1,500 to the marathon and that has never been done in British history. LRC Will Geoghegan Q & A: The Secrets Of Going From 4:05 To 3:58 In The Mile Are Revealed Will Geoghegan‘s story shows not all track stars are born overnight – it just seems like it as he went from 4:05 to 3:58 last week. 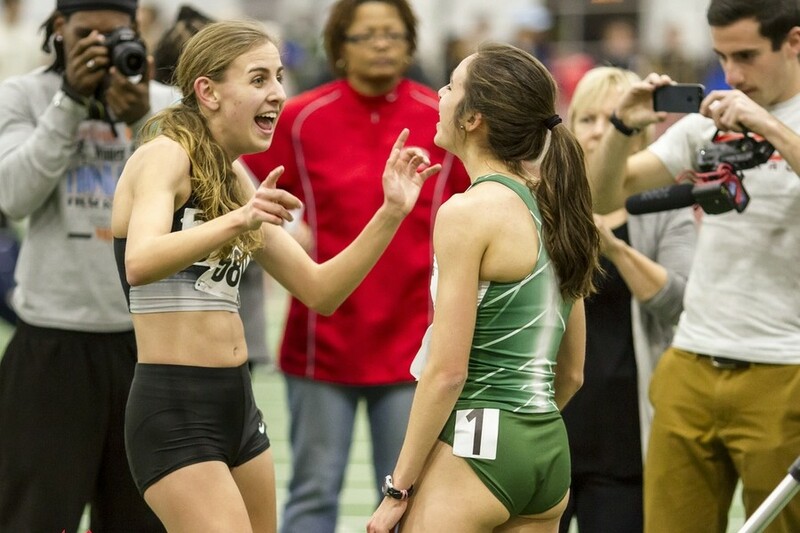 The Dartmouth senior is on a roll in 2014, leading the NCAAs in the mile, but it was not an easy ride to the top. Freshman year, he quit the Dartmouth team and was flunking his courses; now he’s going to have his pick of schools for his fifth year, unless he takes an LRC internship. *MB: Will Geoghegan to NOP? Phoebe Wright Blogs: “The time I prepared for New Years Eve like I did the US champs.” Wright explains how with extreme dedication you can be an elite distance runner and still party on New Year’s Eve. 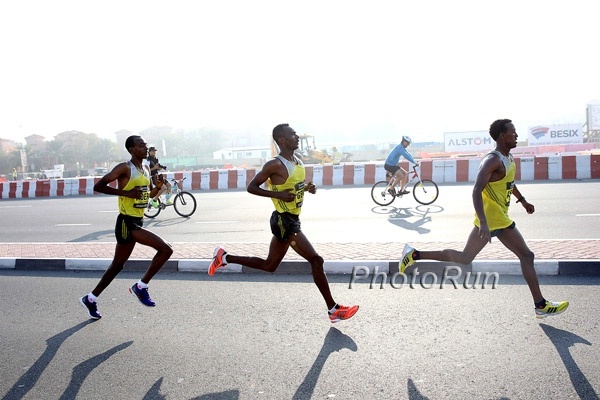 Athletics Kenya Regions Hosting Their XC Championships This Weekend In Next Step To Choose Team For Africa XC Championships Road 10k/15k WR holder Leonard Komon, Emmanuel Bett and World junior XC champ Faith Kipyegon among those competing. Competitor.com Talks To Ben Bruce Ahead Of His Debut Marathon This Sunday In At RNR New Orleans He says he just wants to win and maybe run around 2:15. Sochi 2014 Forced To Backpedal On Comments Made By Top Official After He Contradicted IOC President Thomas Bach The Russian head said that athletes wouldn’t be allowed to express their political views in press conferences when Bach had already said they could. 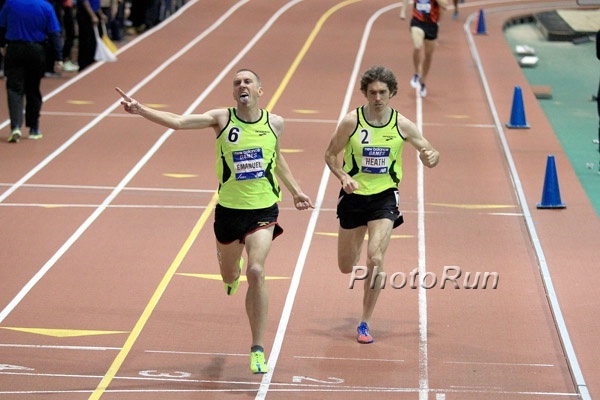 LRC Bye-Bye Alan Webb, The Bold Galen Rupp And Mary Cain, Marathoning’s New Era, Can Ryan Hill Challenge Rupp? 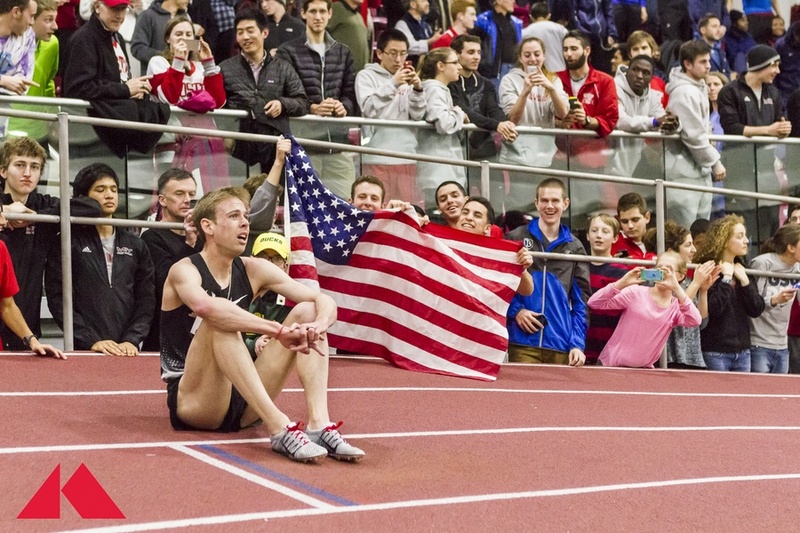 And Much More Alan Webb says goodbye to track and field, fortune favors the bold and Galen Rupp and Mary Cain, and do we have an American challenger who can beat Mr. Rupp? A proposal to save the marriages of NCAA track coaches, a star retires at age 25, and those crazy youngsters – a teen runs two half marathon PRs to win $200,000, a look at Britain’s great young talent, some fast NCAA times by Laura Roesler, and someone break up the Big Green of Dartmouth. 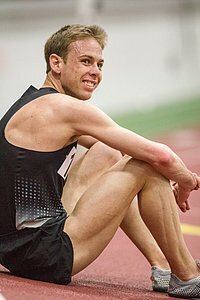 Q&A With Alan Webb On Triathlon.com About His Goals For The Sport Webb dreamed big in running and he’s dreaming big again here. 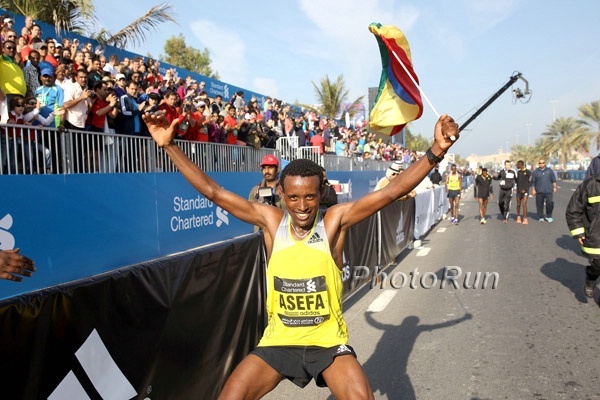 LRCWhat's Your 2013 Running Photo Of The Year? 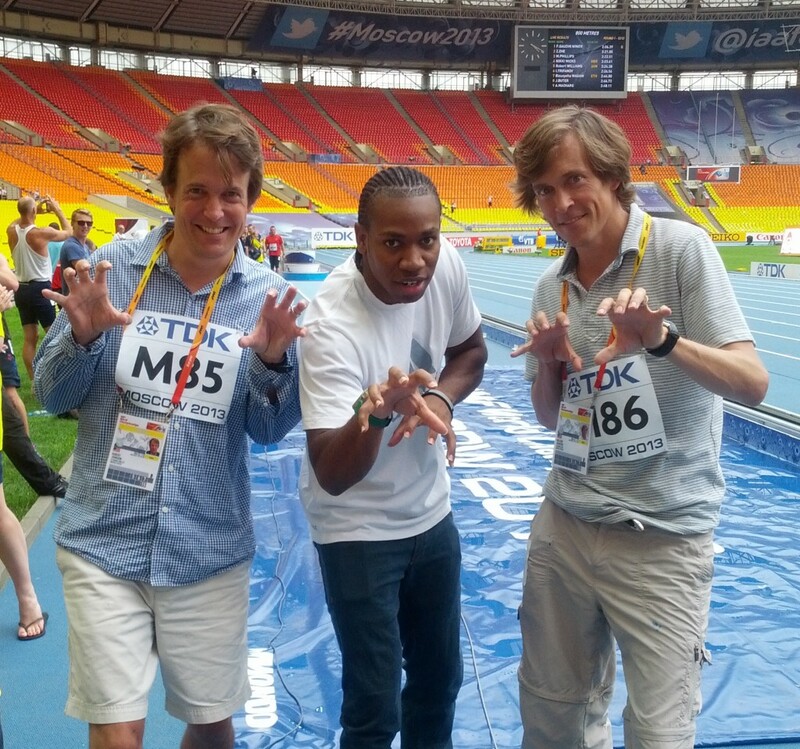 Rojo, Wejo and Yohan Blake performing "The Beast" is our personal LRC photo of the year. 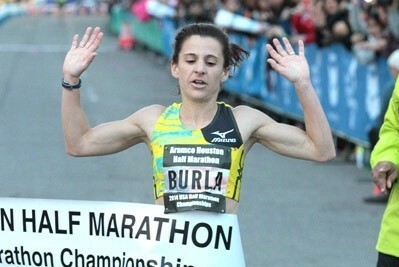 What's your 2013 running photo of the year? Submit or tweet your entries to us. Winner gets a cool $100.